In 1986 and 1987, two parks installed Jet Star roller coasters from Schwarzkopf inside warehouses. Black Hole at Avonturenpark Hellendoorn (Hellendoorn, Netherlands) opened in 1986 and Starchaser at Kentucky Kingdom (Louisville, KY) in 1987. Starchaser was a frequent traveler, since it started its career at Beech Bend (Bowling Green, KY) where it ran until 1984. Then, from 1987 to 1995 it ran at Kentucky Kingdom. Then, Premier Parks bought the ride and it was moved to a new building at Darien Lake (Darien Center, NY) under the name Nightmare at Phantom Cave where it had a disco ball in the gravity building that illuminated the track. There, it ran from 1996 to 1998, when the ride small capacity was deemed too small for the rebranded park. It went to Great Escape (Queensbury, NY) and again got a brand new building. Rerouting the log flume and a train ride, the new show building and theming pushed the envelope for the Nightmare at Crack Axle Canyon over 3 million dollars. Unfortunately, capacity woes doomed the ride, as only 3 cars with 2 riders each could operate at once. It meant horrific lines with an hourly capacity of less than 120 riders per hour. 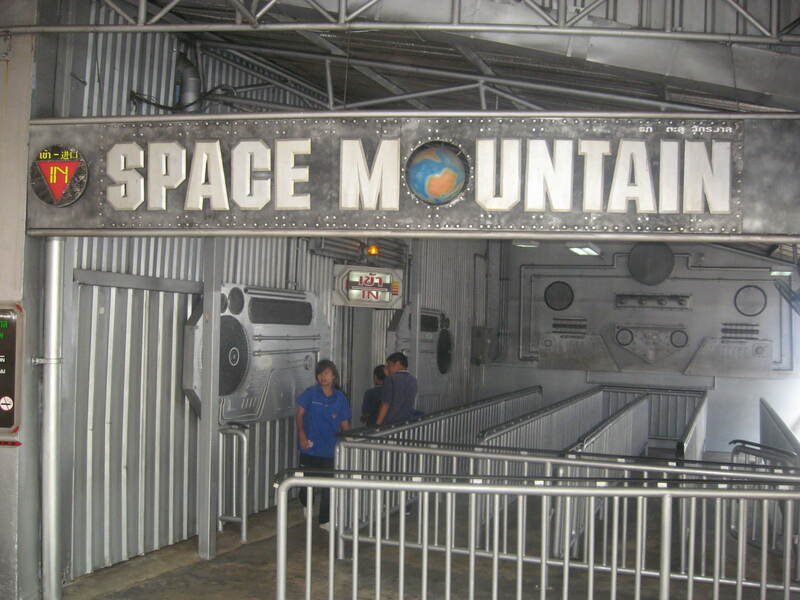 It operated on and off from 1999 to 2006, including an entire season where it sat closed while the park tried to find solutions to the capacity issues. Interestingly, even though the roller coaster left the park, those large buildings were still very useful to the parks. At Kentucky Kingdom, it is used to house a motion simulator that used Iwerks Turbo Theater technology. Over at Darien Lake, the Batman Thrill Spectacular stunt show was housed inside the building, with motorcycle chases and large pyrotechnics. After Six Flags sold the park, various productions have used the now renamed Galaxy Theater. 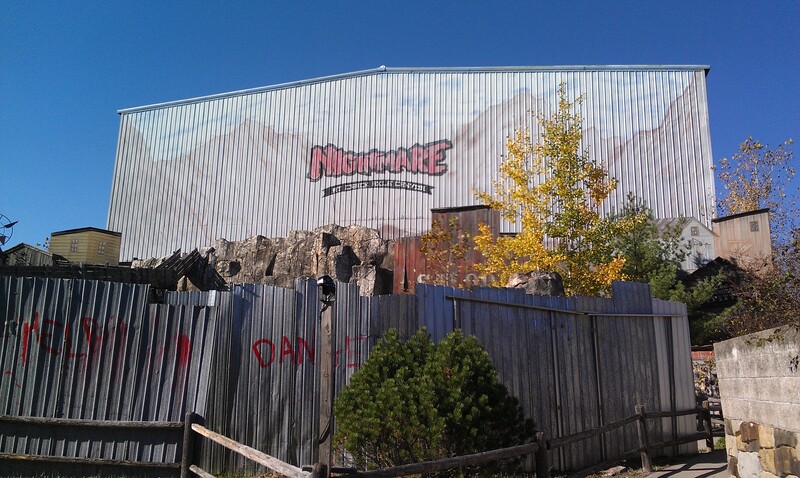 Over at Great Escape, after the roller coaster was scrapped, it was used as a warehouse until 2013, when a new Halloween walk through experience took advantage of the exterior theming and building. The Nightmare building at Great Escape with the beginning of the walk through outside. In 1987, Lightwater Valley in Ripon, UK had a very curious idea. What if we built an underground coaster? The park has a nice hilly setting and so, they built a warehouse behind one of the park’s hill and cut tunnels through the ground to lead back toward the park. A Schwarzkopf Wildcat was located and the cars redressed to giant rats. So, the “Sewer Rat” ride experience was born. The waiting line was damp, cramped and felt like a trek through the sewers to the ride. The ride itself had no theming in the gravity portion, but everyone remember the walk to and back from the rats. In 2010, the sewer theming was tired, so the park went to another premise: oh no, the tunnels are now infested with dinosaurs! The ride was rethemed to Raptor Attack and it fits in well with what was already there. In 1988, Vekoma launched a new model line: enclosed Coasters. Two styles were proposed and with the aid of new computer programs, smoother and faster layouts were possible. The first three to open were the Nightmare at Boblo Island (Amherstburg, ON), Supernova at the World Expo 88 (Brisbane, Australia) and the Space Center at Phantasialand (Bruhl, Germany). Nightmare used the MK-700 track with the bobsled style cars. The ride itself was not themed, but the ride location in the park appears to be the historic Dance Hall, that was commissioned by Henry Ford, founder of the Ford Motor Company. After the park closed in 1993, it was purchased by Six Flags and installed the following year at Six Flags Astro World (Houston, TX) as the Mayan Mindbender. A new building was constructed and it was a Mayan pyramid. Guests ventured through the hallways and reached the station, where the lights would dim every time the 24 passengers train would leave and get on the 28 feet tall lift hill. It was tire driven in order to avoid noise that would bounce around the building and once at the top, the ride consisted of a succession of turns and helix that would end with a small camelback hill into the brakes. After Astro World closed in 2005, the ride was purchased by Wonderland Park. 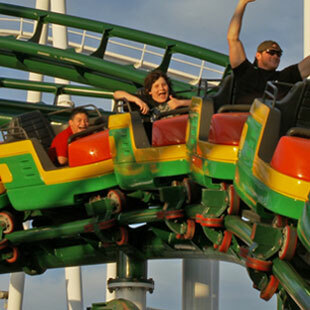 Also located in Texas in the city of Amarillo, the ride was set up outside and given the name of the Hornet in 2009. Space Center opened that same year and it used the MK-900 track and trains. Remarkably, the building was also designed by Vekoma and they managed to cram 3821 feet of track with 3 lift hills inside. What is even more insane is that the ride is at the 26 feet level of the building. The basement and under was left as expansion space, which the park filled in 1991 with an Intamin water dark ride themed after Hollywood movies. 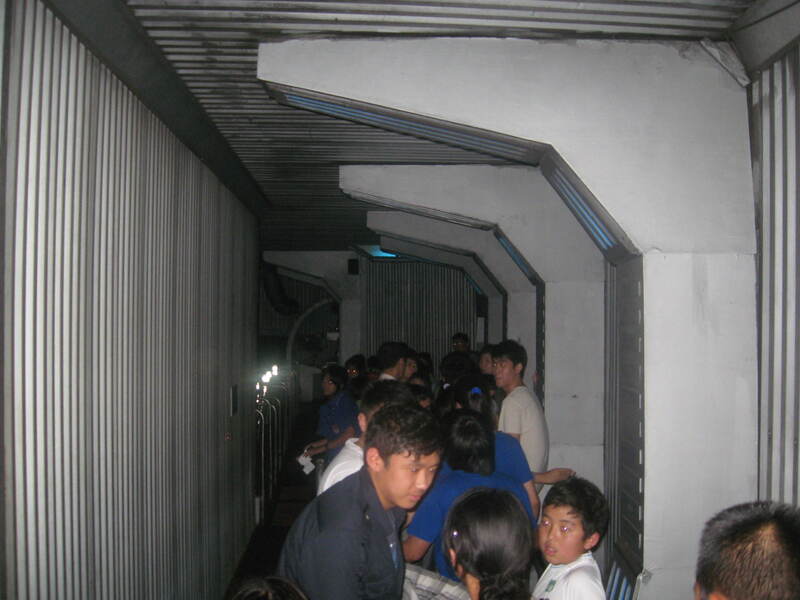 The original theme had Space Control scenes in the waiting line and the ride itself was mostly just dark with little scenery to see. The tallest lift is 38 feet tall and four trains can run on the ride, allowing good capacity. Those trains were themed after Space Ships and painted gunmetal gray. As a unique feature, in the station, the exhaust ports would light up in red, to simulate warming up the engines for lift off. In 2001, when the nearby Winjas were under construction in Wuze Town, the ride got a new theme and name. Temple of the Night Hawk was to allow riders to simulate the daring attacks that the bird of prey was known for. The waiting line scenes were covered up and the station got a night time jungle theme. The music of the 2000 movie “Dinosaur” played in the station and throughout the ride. The ride cars got dirtied up and sand glued to the frame. On ride, the only effect is a neat projection on windows of a green hawk using green lasers. Today’s entrance of Temple of the Night Hawk. Supernova had a similar theme to Space Center, but the ride was smaller. It used two 4 cars trains and had a special effect filled lift hill and various props along the ride. When the park closed in September 1989, the ride went in storage. Supernova reopened in 1994 at the new Dream World (Thanyaburi, Thailand) and was renamed “Space Mountain”. Much of the original effects, props and possibly even the building were reused for this installation. Space Mountain in Thailand entrance. The waiting line that leads to the station. For the 1988 season, a European ride company, that could possibly be L&T System from Italy commissioned an Australian steel company called Hyfab to fabricate a Wild Mouse Roller Coaster. The customer was the Dreamworld theme park, located in Coomera, Australia. 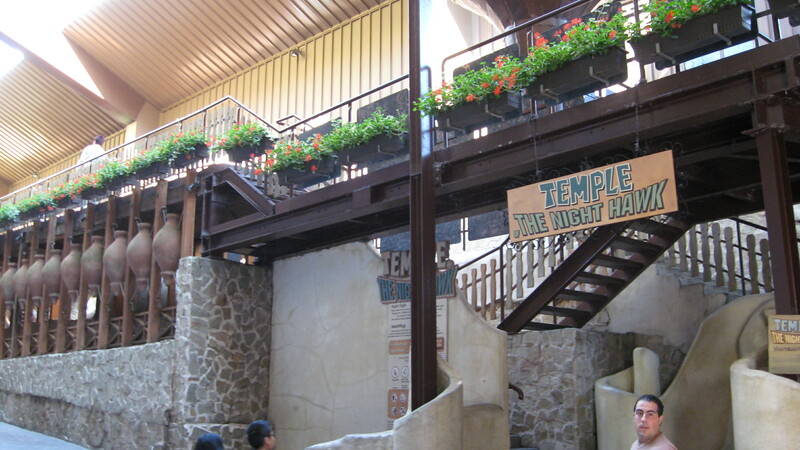 It was enclosed in a elaborate building that was patterned after a Gold Mine and named the Eureka Mountain Mine Ride. At the top of the lift hill, an animated miner blow up a stick of dynamite, thus starting the high speed journey through the dark mine shafts. To replicate a real mine, a few of the turns are also outside, thus replicating what late 1800’s mine in the American far west look like in the movies. The park closed the ride in 2006 and is currently not operating at the park. 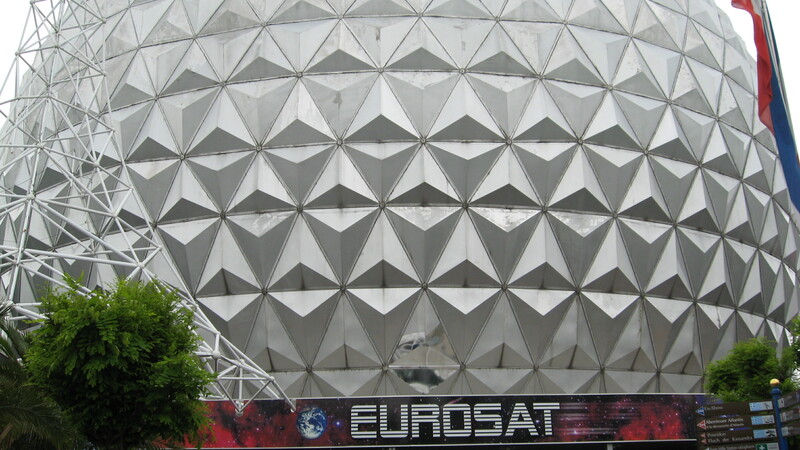 In 1989, Europa Park in Rust, Germany built a new geodesic dome in the France area of the park. Housed inside is a new style roller coaster where the spiral lift hill of the old Broadway Trip/Love Bugs/Wizard Cavern was used to take 16 passengers trains up in a compact area. The dome is 148 feet tall and the roller coaster itself is 84 feet tall inside. Most of the waiting line is in front of the silver dome under a large marquee advertising the name of the ride. Groups are periodically sent up escalators and then inside the space corridors that lead to the waiting line. You can see the large banks of computers that run the ride and the name here is efficiency. Capacity is incredible as up to 7 trains can run at a time, giving 1550 passengers per hour throughput. The lift has techno music pounding as we go up in the middle of the ride. Once at the top, the ride starts spiraling around the building in gradually more forceful turns. Various green lasers go around as you go down and at the bottom, you fly through a smoke cloud and dodge asteroids and experience more laser effects as our train now pull incredible forces of 4 G’s in the turns. The end is perhaps the most uncomfortable, as the braking is very sudden and sharp, to replicate a spaceship returning to earth. 1989 saw Vekoma launching a new kind of enclosed roller coaster. They called it the Illusion and those rides were housed in large 4 sided pyramid shaped steel buildings. The only two to have been built were the Chaos at Opryland (Nashville, TN) and the Revolution at Bobbejaanland (Lichtaart, Belgium). The layout is very simple: you have a long 30 or 40 cars long MK-700 train with the bobsled cars. The train leaves the curved station and head inside the inner room. It then goes up a tire driven spiral that circles the room and as that goes on, an elaborate show is projected on two huge parabolic screens placed at the bottom and top. The original theme had things happen on the top screen, such as a swinging pendulum and explosions. Then, the bottom screen would show the aftermath, such as it “breaking” due to the crashing pendulum. It was a unique experience that was well received, but the huge at the time 8 million dollars construction cost unfortunately lead to those two being constructed. Throughout the years, effects broke down and were either replaced by lights, simpler props or simply removed. Chaos closed at the end of the 1997 season along with Opryland and was never rebuilt and eventually scrapped in the early 2000’s. 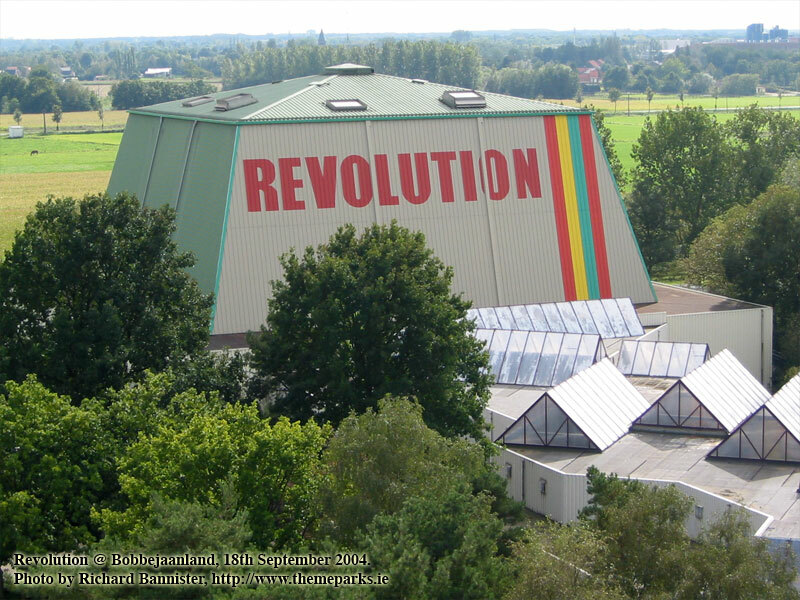 Revolution is still operating and after an identity change, returned back to the original show in 2014. The original 35mm films were replaced by digital projectors. Space World in Fukuoka, Japan constructed in 1990 the Black Hole Scramble. It was built by a Japanese steel manufacturer (Nippon and this ride was their only documented roller coaster) and housed inside a silver round dome near the first drop of the Titan V hyper coaster. The ride use trains of two cars with 6 passengers per train. The ride starts with small drops and turns in the dark, with some lights and effects going around the riders. Midway, the train reaches the ride lift hill, which is housed inside its own tunnel and more lights are projected as we go up the chain lift. ting and after an identity change, returned back to the original show in 2014. The original 35mm films were replaced by digital projectors. In 1990 as well, Cedar Point (Sandusky, OH) hired ITEC Productions Inc. to revitalize and solve an operation issue for their Intamin “Swiss Bobs”. Known as Avalanche Run, its location near the beach caused issues with the Bobsled configuration unable to run when the trough was wet and when the wind blew sand toward the ride. Walking toward the ride from the middle of the park. 12E refers to the ride designer 12th ride that he designed. So ITEC designed a large show building for the queue, most of the ride and lift hill. A smaller soundstage was constructed for another scene and the steel trough fully enclosed to steel tubes to connect the buildings. When riders would enter the building, they would pass through the Rocket Recovery, Mission Control and Repair Bay while walking in the waiting line. 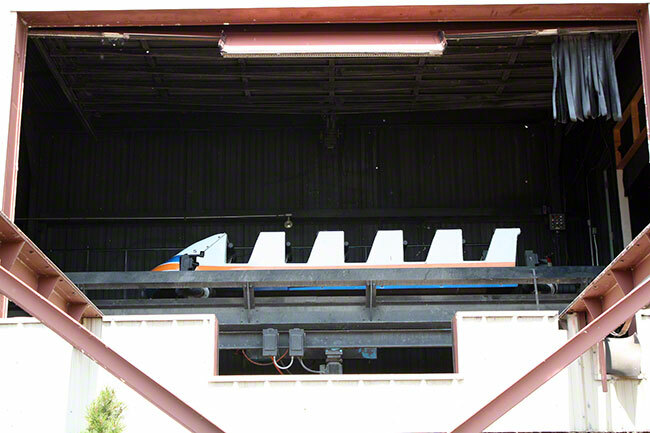 Then, they would reach the launch room and be loaded in one of the ride’s 5 sleds. 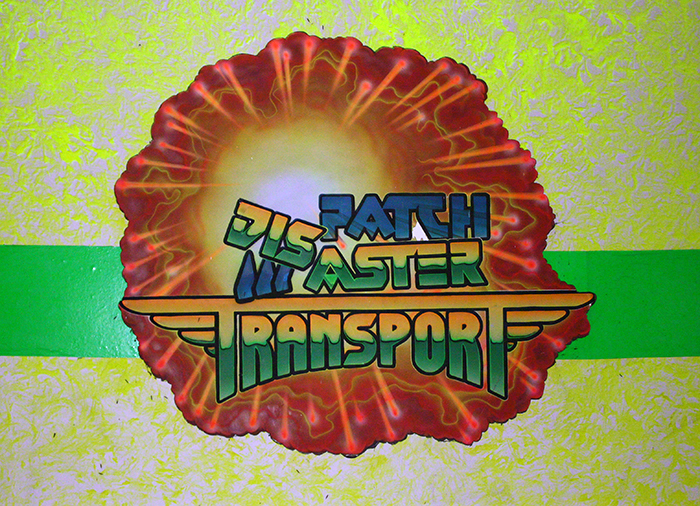 The ride name came from a neon sign and other stickers that say: DISPATCH MASTER TRANSPORT. Some of the lights burned or dropped out leaving “DISASTER TRANSPORT”. Here is one of the sled about to enter the lift hill. Maintenance had opened a service door and that is why we can see it. There are 5 rows of two riders in each car. Throughout the ride, riders would originally see various dark ride style scenes that were lighted up, but the ride effects were not maintained properly and it eventually turned into a pure in the dark Bobsled ride. It was an expensive makeover, as the ride cost 3.4 million dollars to build in 1985 and an additional 4 million dollars invested in 1990 for the makeover. The ride was dismantled in 2012 and replaced by the Gate Keeper Wing Coaster in 2013. In 1991, Flamingo Land in Malton, UK opened the Thunder Coaster. This consisted of a brand new Pinfari Z40 roller coaster that had a steel building wrapped around it. The building façade had some rockwork on it and the ride name. 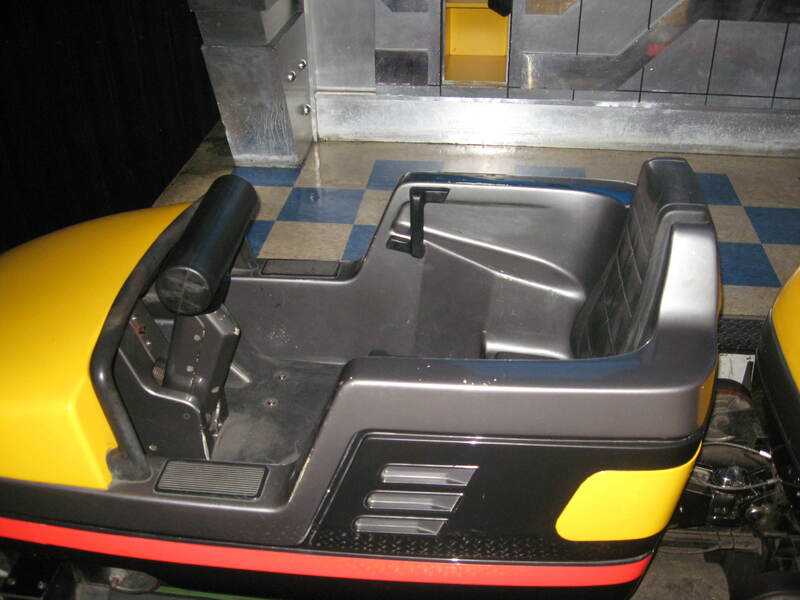 The ride itself had red track, white supports and used small 4 passenger cars that had shoulder restraints. In 1991 as well, Black Hole at Avonturenpark Hellendoorn (Hellendoorn, Netherlands) was switched out for a Zierer Flitzer. This small family roller coaster got new rat cars and renamed the Rioolrat, which is dutch for “Sewer Rat”. It operated until 1995. Spaceship 2056 opened at New Reoma World in Takamatsu, Japan in 1991. This Sansei-Yusoki roller coaster is housed into a custom pavilion designed by Syd Mead, a legendary industrial designer. He created landscapes and vehicles for iconic films such as Tron and Blade Runner and his style can be seen in the waiting line and loading station of the attraction. This ride is very unique as well for the ride layout, because the riders never experience any lift hill. The loading station is at the top of the ride and after riders exit the 12 passengers train at the unload dock, the lift hill is after. Formosan Aboriginal Cultural Village in Yuchr Shiang, Taiwan opened their first roller coaster in 1992. It was placed at the back of the new “Aladdin’s Kingdom” indoor area and curiously enough, named Space Mountain. The ride selected by the park is a custom MK-700 with space themed cars and it use two 8 cars trains. The loading station has a starship hanging from the ceiling in the same style as the Space Mountain at Disneyland. The ride feature a chain lift with some pretty lights around it and the ride consists of various helixes around the gravity building before concluding with a great airtime hill. Vekoma also managed to design the ride around the park Mack Monorail, which goes through the same room. The front car on Space Mountain. This entry was posted in Coasters and tagged Europa Park, Eurosat, jet star, Kumbak, Phantasialand, Revolution, schwarzkopf, Space Mountain, Temple of the Nighthawk, Vekoma. Bookmark the permalink.